Download this new infographic to learn the facts about what economists are forecasting and the steps you can take to prepare. After you download the infographic, share this article with your network through Facebook and Twitter! Mapping out a plan of action ahead of time gives leadership, staff and agents a chance to discuss strengths, weaknesses and alternatives well before having to take action. Marnie Blanco, dotloop Vice President of Industry Relations, notes that the leading brokerages are already preparing for a change by getting their houses in order. “They’re reviewing operational costs on everything from their physical offices to support and technology. And it’s not just high overhead they’re concerned about. They’re figuring out ways to consolidate technology so they not only save money but they end up with an efficient and robust system,” she says. Blanco adds that much of the customization dotloop is performing for larger brokerages now aligns with this philosophy. Many brokerages, she says, are already training agents to be ready for a downturn. “Last time, the change in market conditions hit agents like a brick wall. As regular listings dropped, foreclosures, REO and short sales skyrocketed,” Blanco says. That’s why forward-thinking brokers are training their agents to prepare for these types of listings as well as how to work with investors. Even if the economy doesn’t take a hard turn, these strategies can enable growth in all economies. Being prepared with the tools and resources that help in a down economy will only lift agents and brokers higher in a strong housing market. An oft-cited study by the Harvard Business Review revealed that nearly 70% of all change initiatives in business fail. In most cases, this inability to adopt a new way of doing things isn’t due to a lack of resources spent by the companies. It’s because people find it difficult to change. People don’t change because they’re given information. They change when they’re able to take ownership of the plan of action. 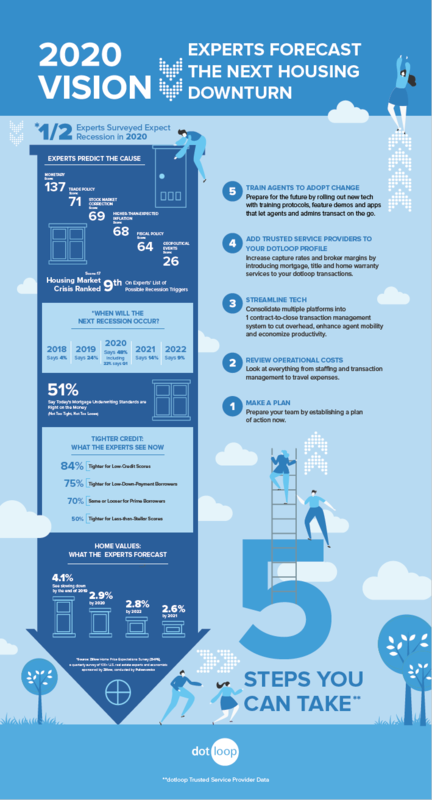 See infographic for helpful tips on helping agents adopt new tech and other changes. New technology that’s designed to bring efficiency and agility should be in place well ahead of time, with staff and agents already trained and using advanced features. This will not only ensure that it’s fully functional when the market demands, but the new tech will benefit the brokerage under any market condition. For example, a brokerage upgrading to dotloop’s all-in-one transaction management platform will immediately gain efficiency from the customized workflows, agent and admin collaboration, and integrations with CRM and back office tools. While investing experts, economists and financial pundits are all on the lookout for signs of the next downturn, Zillow”s Terrazas says that it’s real estate agents who might have the best insight into when that will happen. Learn why thousands of real estate brokers and teams trust dotloop to move their business forward.